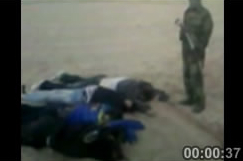 A screen shot from the Ansar al-Muslimeen video that purports to show the bodies of several executed foreign hostages. Image from the SITE Intelligence Group. A radical jihadist group in Nigeria that kidnapped seven foreigners last month claimed it has executed the hostages in response to a joint Nigerian and British military operation to free them. Ansar al-Muslimeen in the Land of Black Africans (Bilad al-Sudan), an offshoot of the al Qaeda-linked Boko Haram, announced that it executed the hostages in a statement that was released today. The statement, which was released in both English and Arabic, was obtained by the SITE Intelligence Group. In the statement, Ansar al-Muslimeen said that it had previously “warned that should there be any attempt by force to rescue” the “seven Christians foreigners,” their lives would be in danger. “By this progress the Nigeria and British government operation lead to the death of all the seven Christians foreigners,” the group concluded. Ansar al-Muslimeen said it would release a videotape of the execution and included screen shots from the tape that purports to show the bodies of the foreign hostages. The seven foreigners are said to be from Britain, Italy, Greece, Lebanon, and the Philippines, and worked for a Lebanese construction firm in the northern state of Bauchi. They were kidnapped on Feb. 17. Ansar al-Muslimeen bombed vehicles at a police station at a town near the construction site and then killed a security guard before capturing the foreign workers. Ansar al-Muslimeen, which is also called simply “Ansaru,” has attempted to influence the situation in Mali in the recent past. The group also claimed an attack on a convoy of Nigerian troops in Kogi state on Jan. 20, saying it was to stop African countries from joining the intervention against al Qaeda-affiliated Islamists groups operating in Mali. The Nigerian troops were preparing to deploy to Mali to fight the al Qaeda-linked groups. Ansar al-Muslimeen announced its formation in June 2012. Abu Usama al Ansari, the terror group’s emir, said that one of its main goals is “restoring the dignity of the Muslims as it was in the time of the Caliphate,” according to the statement, which was obtained and translated by the SITE Intelligence Group. “The method of achieving these aims and goals is “jihad,” al Ansari said.